Paan Singh Tomar lived a fascinating life. A gifted athlete betrayed by his government, his story went largely unnoticed until thirty years after his death. But the movie made about him doesn’t quite do him justice. The film opens in 1980 with a sort of framing device: a reporter seeks an interview with the legendary dacoit (“bandit”) Paan Singh Tomar. I say it’s only sort of a framing device because the action of the last thirty minutes of the film all takes place after the interview. Paan Singh (as he’s referred to) explains that he’s not a bandit, but a rebel. He narrates his story to the reporter, starting in 1950 as a young army officer. Paan Singh (Irrfan Khan) angles for a spot on the national track and field team — an offshoot of the army — because the athletes get larger portions of food at mealtime than soldiers do. Since TVs weren’t common household items at the time, Paan Singh’s athletic achievements go largely unnoticed outside the big cities. His wife doesn’t learn that he’s set a new record in the steeplechase until he tells her himself on one of his brief trips home to his small town. Paan Singh leaves the army when a cousin, Bhanwar Singh (Jahangir Khan), attempts to seize all of the local farmland for himself. Paan Singh is offered the chance to move his family to safety and coach the national track and field team, but he elects to fight for his farm. He asks the local police for help, citing his service to the country in the army and in competitive athletics. The police have never heard of Paan Singh Tomar, but they know Bhanwar well, thanks to the generous bribes he pays them. Unable to stop his cousin peacefully, Paan Singh and the other displaced farmers wage a guerrilla war against Bhanwar. The events of Paan Singh Tomar’s life are certainly exciting enough to inspire a feature film. The problem is in the way the plot unfolds. It’s as though writer-director Tigmanshu Dhulia is ticking off boxes on a biographical checklist, rather than telling a story. Scenes are too brief, ending abruptly before moving on to the next too-brief scene. In an effort to hit all of the biographical highlights, character development is minimized. Paan Singh’s wife, Indra (Mahie Gill), has little to do apart from submit to her husband’s groping on his brief visits home. I’d have thought she’d have a lot to say about his choice to spend his military career away from her and their children, only to spend the rest of his life running from the law. We never hear her side of the story. There’s little time allowed to explore the motivations of the characters, and that includes those of Paan Singh himself. The nobility of his choice to fight for his family farm is tempered somewhat by the means by which he finances his guerrilla war. He and his gang kidnap people and use the ransom to buy weapons. But, even after the situation with Bhanwar is resolved, the kidnappings continue. Why? Was retaking his farmland for his family Paan Singh’s real goal? Was it simply revenge? Is he really a rebel or just a vigilante? Even with his lack of character development, Khan gives a gripping performance as Paan Singh. As the movie progresses, it’s easy to get caught up in Khan’s charisma. It’s only after the movie ends that the questions of “Why?” come to the forefront. Paan Singh Tomar doesn’t offer enough answers. This entry was posted in Reviews and tagged 2.5 Stars, 2010, 2012, Bollywood, Hindi, Indian, Irrfan Khan, Jahangir Khan, Mahie Gill, Movie Review, Netlfix, Paan Singh Tomar, Tigmanshu Dhulia on June 29, 2012 by Kathy. Two new Hindi movies are set to open in the Chicago area on March 9, 2012. Vidya Balan stars in the thriller Kahaani (read my review here) as a pregnant woman searching for her missing husband. Kahaani opens on Friday at the Big Cinemas Golf Glen 5 in Niles and AMC South Barrington 30 in South Barrington. It has a listed runtime of 2 hrs. 30 min., but the actual runtime is closer to two hours. This weekend’s other new Bollywood movie is the romance Chaar Din Ki Chandni, which opens on Friday at both of the above theaters. Last weekend’s major new release, London Paris New York, carries over at the Golf Glen 5 and South Barrington 30. 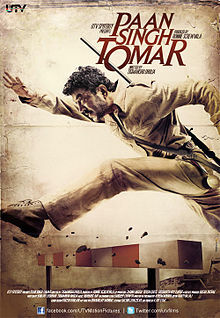 Paan Singh Tomar leaves area theaters after earning just $20,568 in its opening week in the United States. Likewise, Ek Main Aur Ekk Tu makes way after amassing a four-week U.S. haul of $1,150,019, as does Tere Naal Love Ho Gaya, which earned $155,247 from two weeks in American theaters. Other Indian movies showing at the Golf Glen 5 this weekend include the Telugu films Ishq and Mr. Nokia. This entry was posted in Weekly Theater Updates and tagged 2012, AMC South Barrington 30, Big Cinemas Golf Glen 5, Bollywood, Chaar Din Ki Chandni, Chicago, Earnings, Ek Main Aur Ekk Tu, Friday, Hindi, Indian, Ishq, Kahaani, London Paris New York, March 9, Movie, Mr. Nokia, Mr. Nookayya, Niles, Paan Singh Tomar, Runtime, South Barrington, Telugu, Tere Naal Love Ho Gaya, Trailer, Vidya Balan on March 7, 2012 by Kathy. Will rom-com fatigue doom London Paris New York, one of two new Bollywood movies opening this weekend in Chicago area theaters? With four romances having opened in the last three weeks — and the dismal U.S. box office performances of last weekend’s new films — it’s a very real concern. London Paris New York (LPNY) stars Ali Zafar and Aditi Rao Hydari in a love story set in three of the world’s most beautiful cities. LPNY opens on Friday, March 2, 2012, at the Big Cinemas Golf Glen 5 in Niles, AMC South Barrington 30 in South Barrington, and Regal Cantera Stadium 17 in Warrenville. The movie is rated PG-13 and has a listed runtime of 1 hr. 40 min. Predictably, the two romantic comedies released last weekend split the audience share, to the detriment of both. Tere Naal Love Ho Gaya (the better of the two films) had the better weekend, earning just $94,583 in the United States. Jodi Breakers fared worse, earning a paltry $52,618. It departs area theaters on Thursday. Tere Naal Love Ho Gaya carries over for a second week at the Golf Glen 5 and South Barrington 30, which also brings back Ek Main Aur Ekk Tu for a fourth week. Ek Main Aur Ekk Tu‘s U.S. theater earnings stand at $1,130,842. This weekend’s other new Hindi release, Paan Singh Tomar, opens on Friday at the South Barrington 30. It stars Irrfan Khan as an elite athlete who becomes a rebel fighter. It has a runtime of 2 hrs. 15 min. Other Indian movies playing at the Golf Glen 5 this weekend include Aravaan (Tamil), Ee Adutha Kaalathu (Malayalam), Ishq (Telugu), and Love Failure (Telugu). This entry was posted in Weekly Theater Updates and tagged 2012, Aditi Rao Hydari, Ali Zafar, AMC South Barrington 30, Aravaan, Big Cinemas Golf Glen 5, Bollywood, Chicago, Earnings, Ee Adutha Kaalathu, Ek Main Aur Ekk Tu, Friday, Hindi, Indian, Irrfan Khan, Ishq, Jodi Breakers, London Paris New York, Love Failure, LPNY, Malayalam, March 2, Movie, Niles, Paan Singh Tomar, Regal Cantera Stadium 17, Runtime, South Barrington, Tamil, Telugu, Tere Naal Love Ho Gaya, Trailer, Warrenville on February 29, 2012 by Kathy.